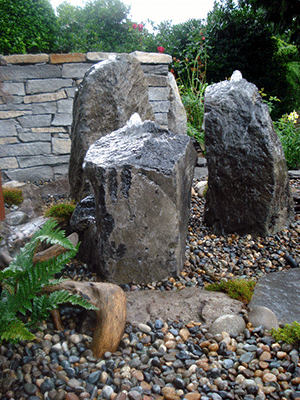 Water features come in many different shapes and sizes and can fit any budget or location. 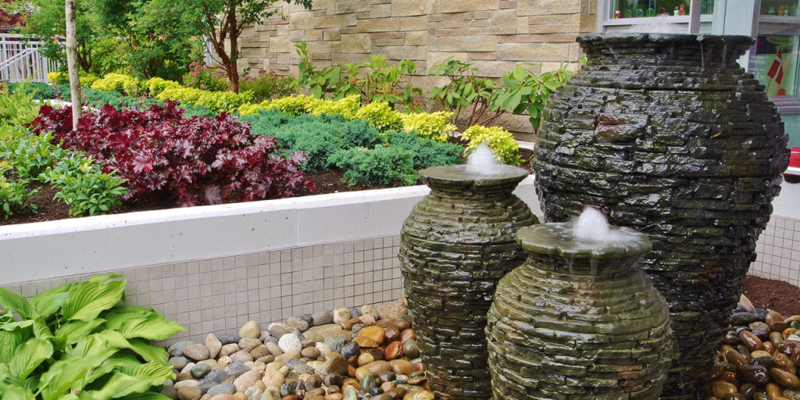 Here are three ideas for small water features that will provide the peace and tranquility of larger ones, without the space requirement. A Spillway Bowl and basin can be installed as a standalone disappearing water feature, or several can be linked together for an amazing display. They can also be added to an existing pond or pondless waterfall. Water is stored beneath the lowest bowl in a small underground basin where the pump is housed. Lights and terrestrial plants (as well as some water varieties) can be added to ‘naturalize’ the feature . Spillway Bowls are very popular and have been featured recently on Houzz and Pinterest. These small water features are similar to the Spillway Bowls in that water is recirculated and stored through the use of an Aquabasin. This natural stone feature looks best when utilizing odd numbers with different heights. Bubbling rocks are very low maintenance and will maintain their beauty throughout the winter, especially as icicles begin to form. Adding lights is a must, as well, as lit bubbling rocks look amazing at night! Another small water feature worth exploring is the stacked urn. Stacked urns look great as a single unit, or in odd numbers at different heights (similar to the bubbling rocks). Stacked urns are most commonly set on Aquabasins, as with the two previous features, but can also be used in a pond or set on top of a pondless basin. LED’s (or even a fire fountain add on kit) can be utilized to light up the feature with amazing results. All of the above small water features are low maintenance, and with the addition of a fill valve can be literally NO maintenance. Any one of these three options is sure to become the focal point of your yard, the envy of your neighbours, and a source of peace, tranquility, and beauty in your life.